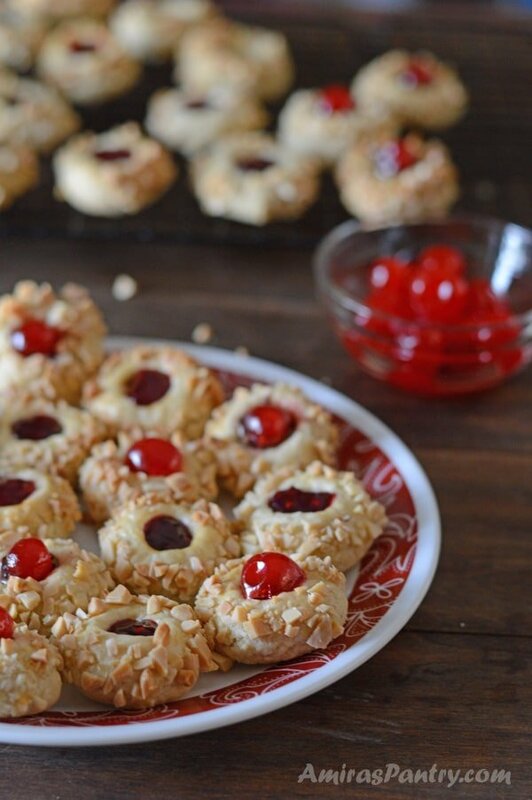 Perfectly soft and buttery cherry thumbprint cookies. 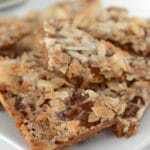 These little gems are not too sweet and pairs very well with a cup of tea/coffee. 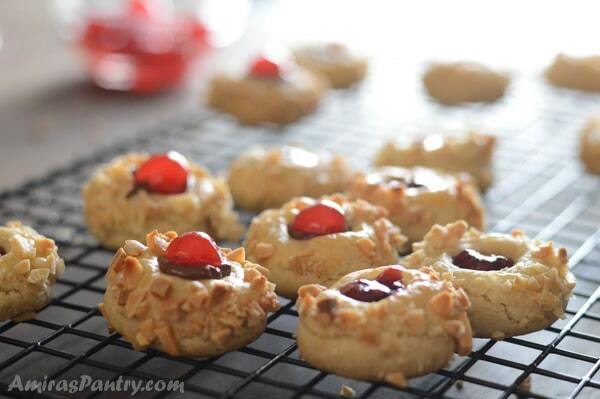 I’ve always liked thumbprint cookies filled up to the top with jam and sometimes drizzled with icing. Tender treats that is gem like and always makes my tea better. 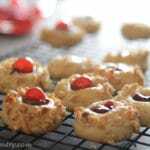 These Ruby cookies are not sweet, that is where the jam comes into play so take that into consideration when selecting your filling. If you need suggestions, my mind always goes to raspberry, fig or apricot jams for filling. Ruby cookies have been on my baking bucket for quite some time. 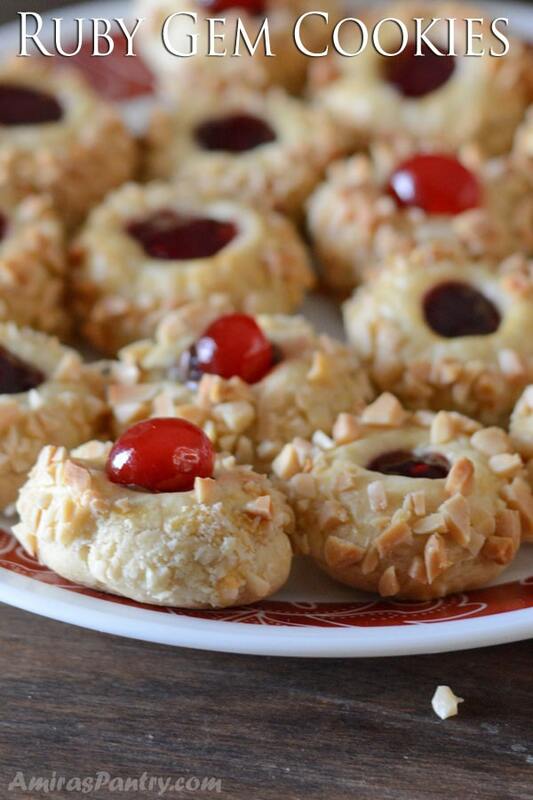 I’ve heard a lot about these delicious Libyan cookies that are so hard to resist. Back in 2009, I got an unclear recipe from a Libyan lady that just said add some flour until you get a good dough!!!. Now this was a big challenge what did exactly “a nice dough” mean?. I’ve compared, tested and retested the dough several times before I left Denver. I’ve taken a million pictures and gone through many pounds of butter and flour but by the 3rd or may be even 4th attempt, I was finally pleased by the end result! Practice makes perfect, after all. I was so determined to make the whole patch every time I retest the dough. 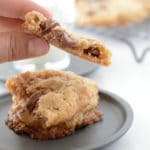 I highly recommend starting with half or even 1/3 of the recipe, then when you master baking them in terms of your oven temperature and your flour, go for the full recipe. This would have saved me a ton of ingredients and hence a ton of frustration as well. So let me show you how it went with me. In the mixing bowl, combine butter, oil, yolk, sugar and cinnamon. Add water, baking powder then mix well. Gradually add flour until you get a uniform dough like that shown above. 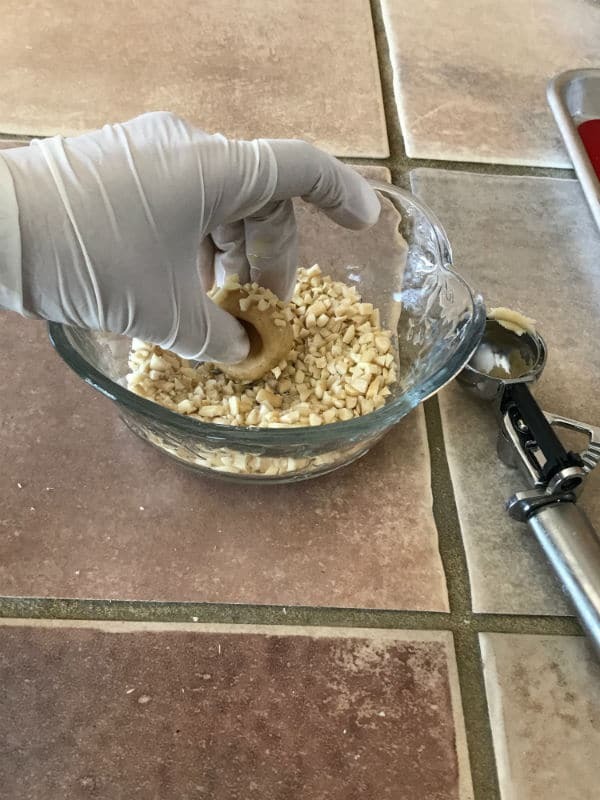 Once the cookie dough has chilled and firmed up, shape into 1 Tablespoon balls. Then make an indentation with your thumb in the center. It is perfectly ok if it cracked a bit, you can smooth it with your fingers or leave it as is. 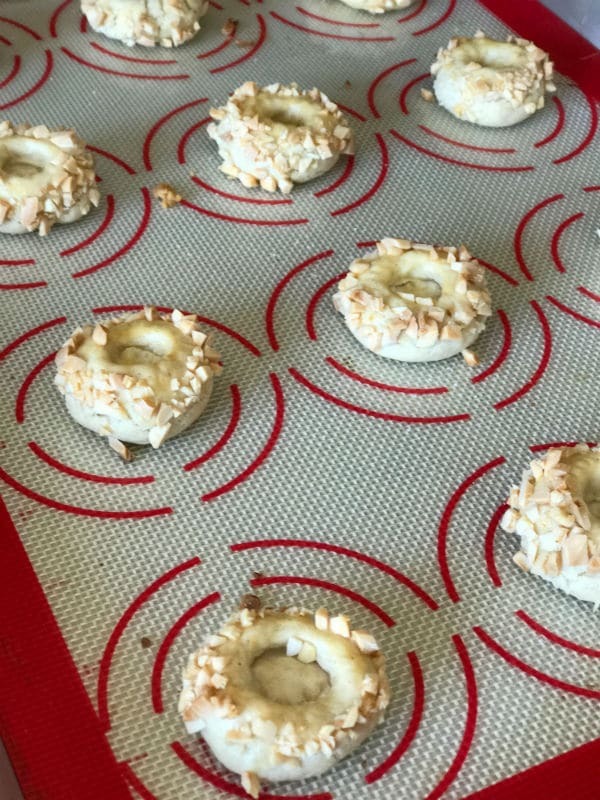 Brush with egg white then roll into almonds, then bake in 375F for 13-15 minutes until just slightly browned from the edges. Fill with jam or Nutella chocolate spread and add half a cherry on top. Looks so festive and delicious. Use shortening instead of butter. Increase the amount of flour. 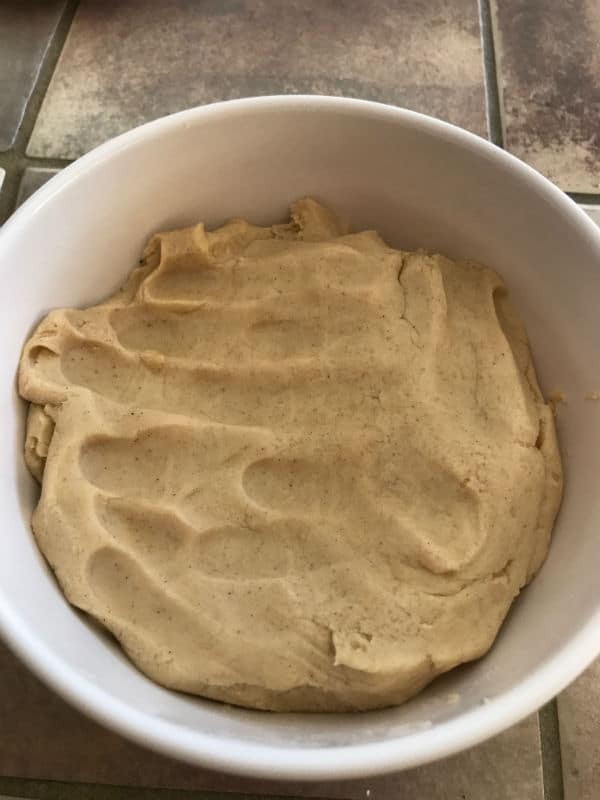 Chill the dough before going into the oven. 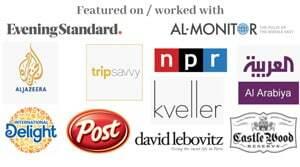 I took these to a gathering and they were a blast. Almost everyone liked them and I’ve got only one comment complaining that it needs more sugar. But seriously this is how these cookies are traditionally made. Another funny comment was that this needs to be served with a drink to make up for the lack of sugar. But many others liked them just they way they were, they even admired their low level of sweetness. 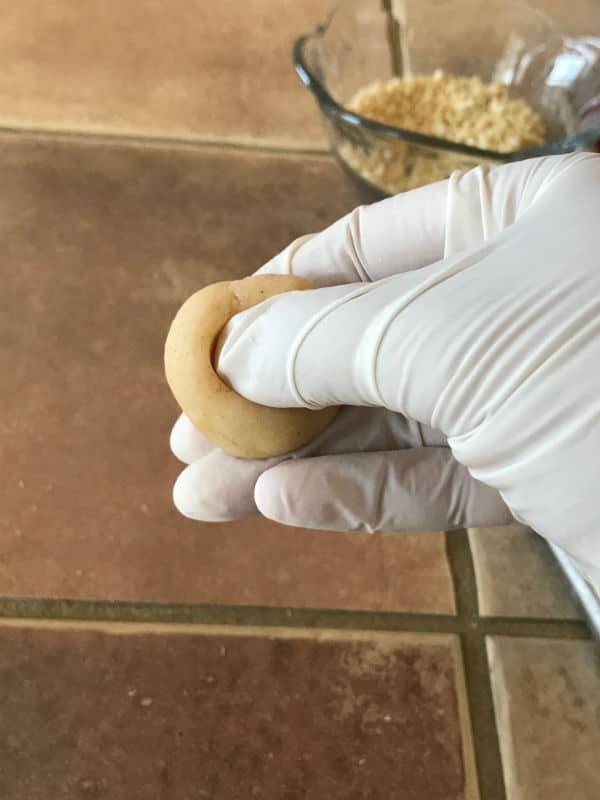 This dough makes 60 small cookies. With Eid coming up, this can be a very delightful way to celebrate Eid and entertain guests. 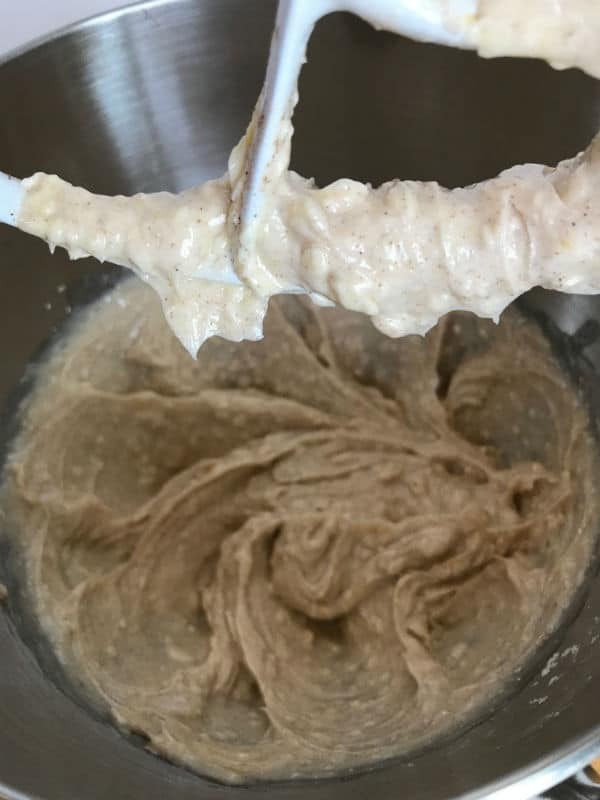 I hope you’ll like this recipe and please if you make this recipe, snap a pic and hashtag it #amiraspantry— I love to see your creations on Instagram, Facebook, Twitter! 1 1/2 cup unsalted butter , room temperature. 1 egg , separate the white from the yolk. 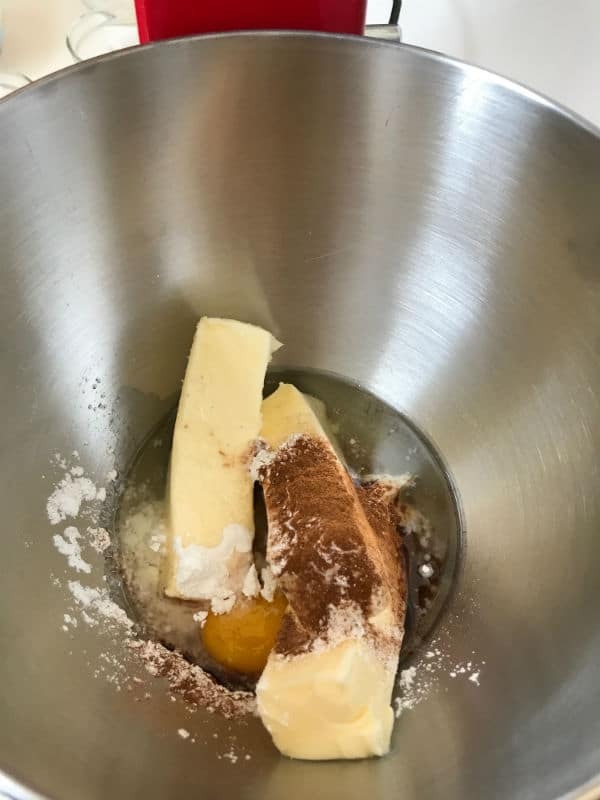 In your mixer bowl, add butter, egg yolk, cinnamon, oil and sugar, mix well. Add water, baking powder and mix again. Start adding flour until you get a uniform consistent dough. 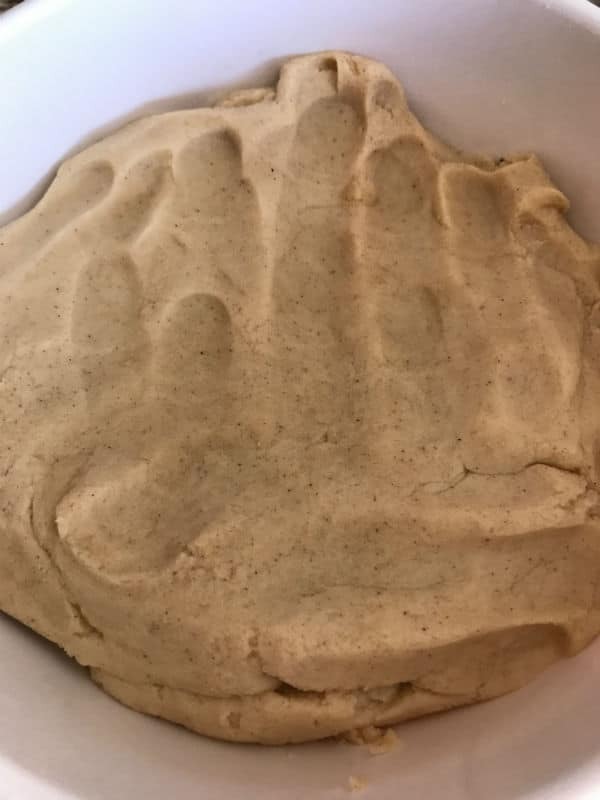 Cover the dough and chill over night. Take part of the dough out keeping the rest in the fridge. 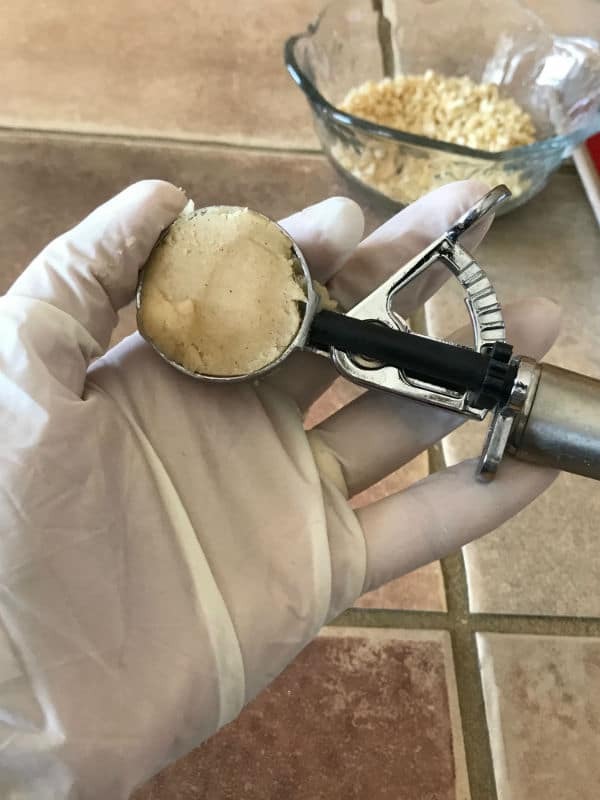 With the small ice cream scoop, form a small ball then with your thumb make a dent in the center. Bake for 13-15 until golden brown from the bottom. 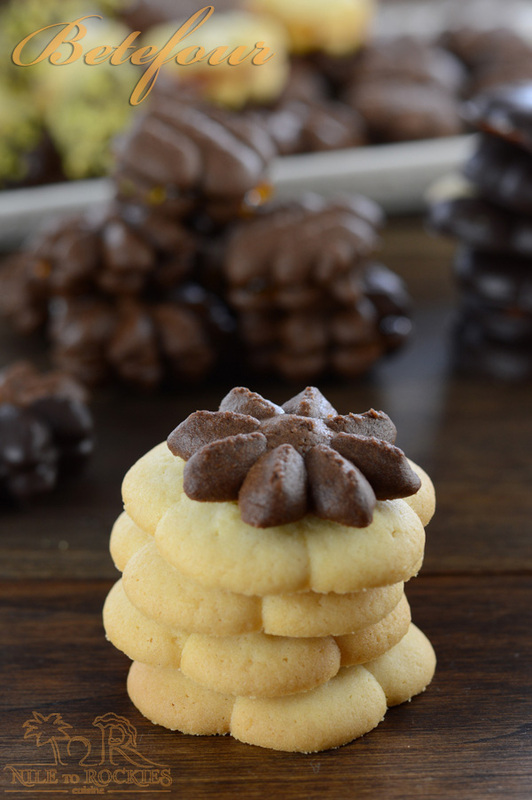 Let the cookies stand for 5 minutes before removing them to a cooling rack. 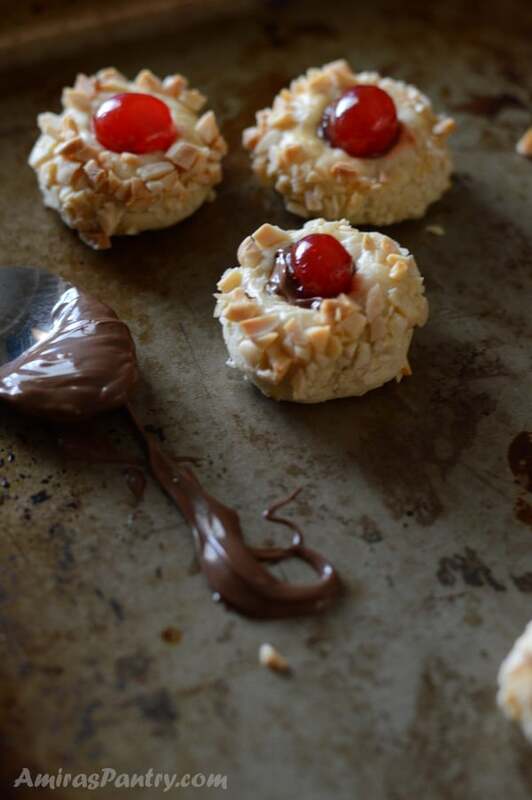 When the cookies have completely cooled, fill each with jam or Nutella and top with half a cherry. 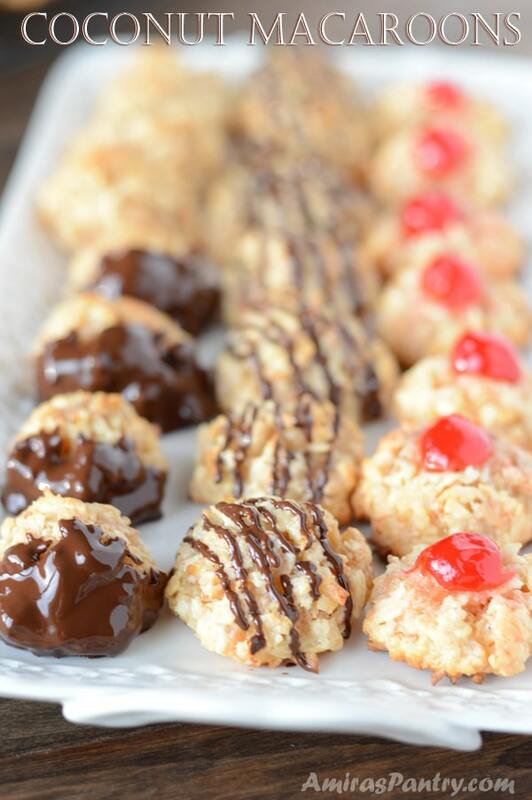 Serve with coffee or your favorite drink. * Make sure your oven gets to the desired temperature I pre heated mine for a good hour before I started baking. ** I found it useful to flash freeze the cookies for like 5-10 minutes while I am working in other batch. This helped greatly to reduce spreading. 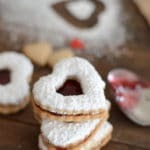 *** These cookies as stated before are so buttery and not sweet at all, that is where the jam comes into play.